Janelle Moore of Oakland, CA. Think March is lacking in national holidays? Well, this weekend you can take part in a makeshift holiday as thousands will be joining in to the National Day of Unplugging to take a 24-hour break from technology. Participants are asked to log off beginning Friday, March 4 at sundown and stay offline through Sat., March 5 at sundown. At nationaldayofunplugging.com, you can sign the "Unplug pledge" and promise to unplug from tech devices including phones, tablets and laptops. This project was started by Reboot, an group that "affirms the values of Jewish traditions and creates new ways for people to make them their own," according to their website. According to Reboot, this day of unplugging was modeled after their "Sabbath Manifesto," which features ten principles like avoiding technology, getting outside and giving back. 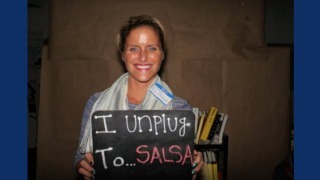 Reboot is encouraging people to share their pictures and updates before and after the holiday on Facebook and Twitter using the hashtag #unplug.